Me and hubby went to Pasay a few weeks ago. We didn't use the car, instead we rode the LRT because the parking is quite difficult in the area where we bought hubby's hydration belt. Pagbaba namin sa LRT, I was surprised to see a stall that sells Pastel. I immediately told hubby that we should buy a box of it so that we can try if its the same taste with our fave Vjandep. I asked first the girl if these pastel came all the way from Camiguin, she said no but the taste is very good according to her. So much of the story... we bought a box and I'm very excited to get home because I wanted our children to try also this Pastel for they so love the one from Vjandep. Justine immediately opened the box and heated the pastel in the microwave..
Oh no! 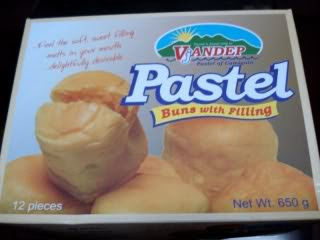 I'm quite disappointed with this... the taste of the yema filling is very far from Vjandep and the bread is quite dry. I hope that they improve the quality of the bread and the yema filling because it lacks the creaminess that we're looking for and sobrang konti ng filling. Thank you for you comments of our pastel. Please try to buy again at SM Mall of Asia every friday, saturday and sunday at the food bazaar. I welcome you next comment of our emproved one.